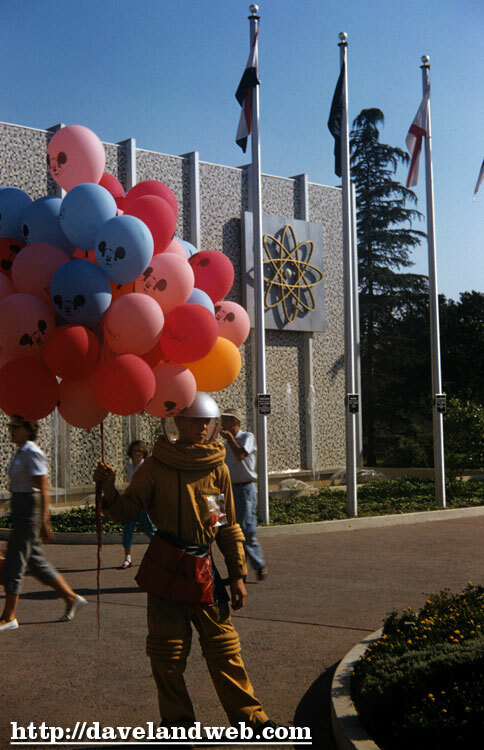 You should be relieved to know that based upon today’s first photo from 1956, balloons ARE part of the future. You just know this poor guy is sweating his $%# off. 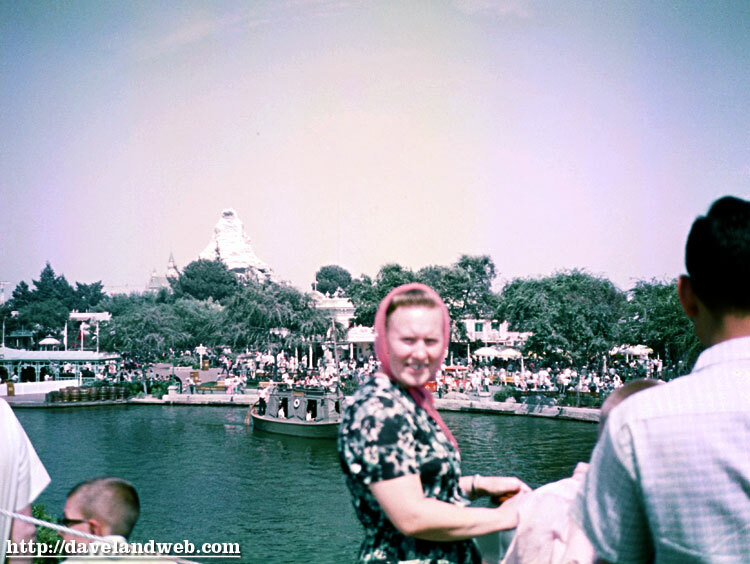 The open-mouthed gal in photo 2 is either shocked at the man in the spacesuit or she has just found out what Tomorrowland is going to look like in 50 years. 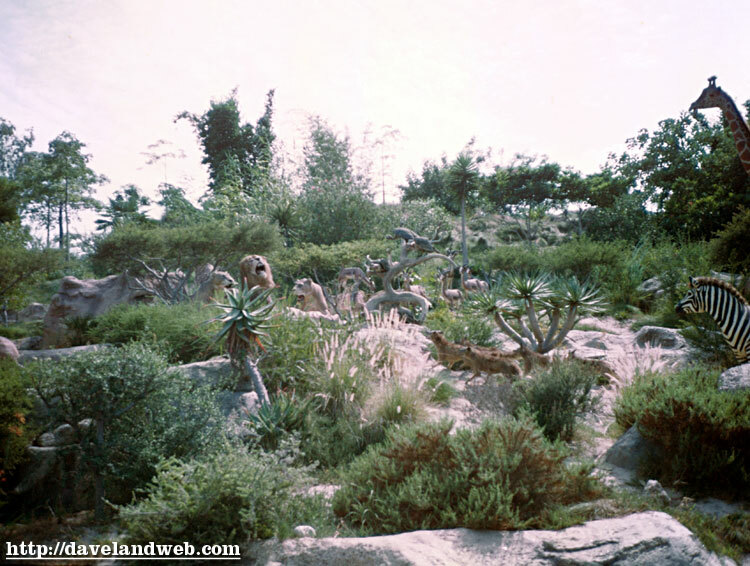 For my Tomorrowland photos, visit my regular website, davelandweb.com/tomorrowland. 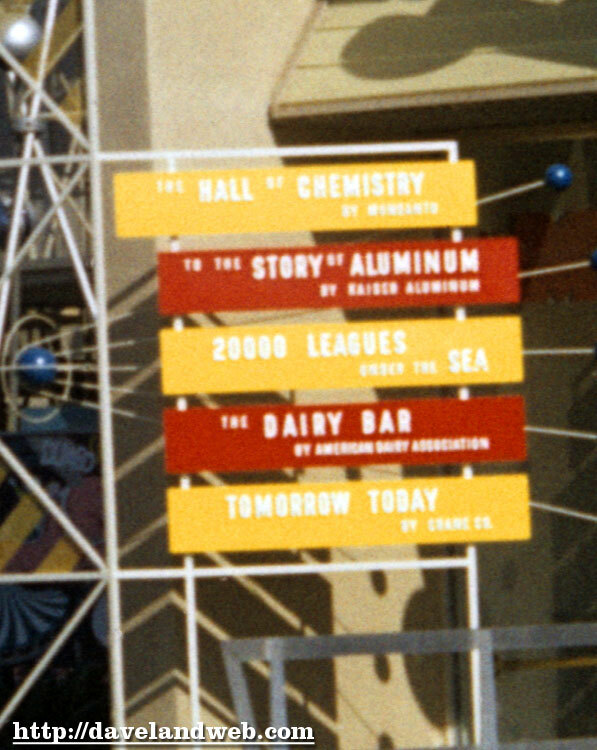 Today’s 1956 excursion takes us to Tomorrowland, with a great view of the Monsanto Hall of Chemistry, which would close in 1966 (today the building is Star Tours). 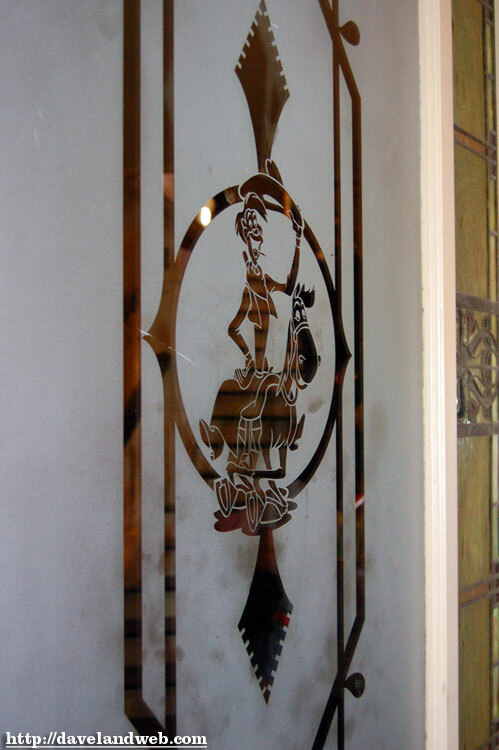 I have also included a detail shot of the front directional signage. 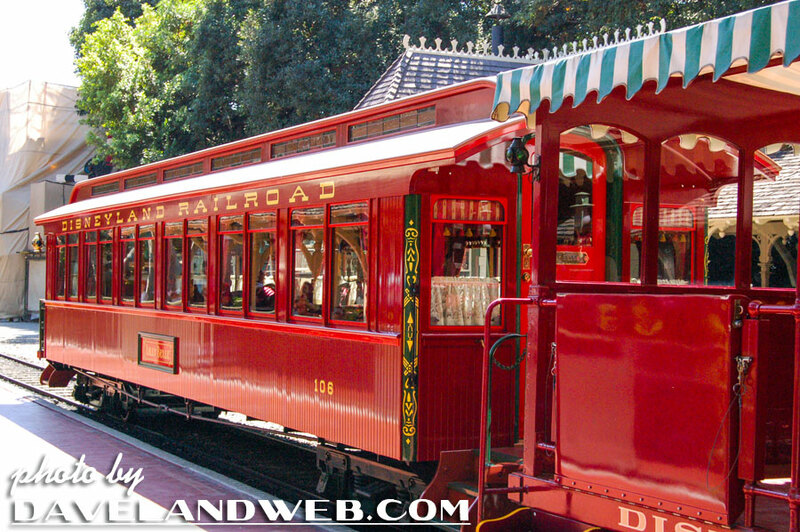 Please vote @ TheDisneyPortal.com for my regular Disneyland website, davelandweb.com/disneyland. 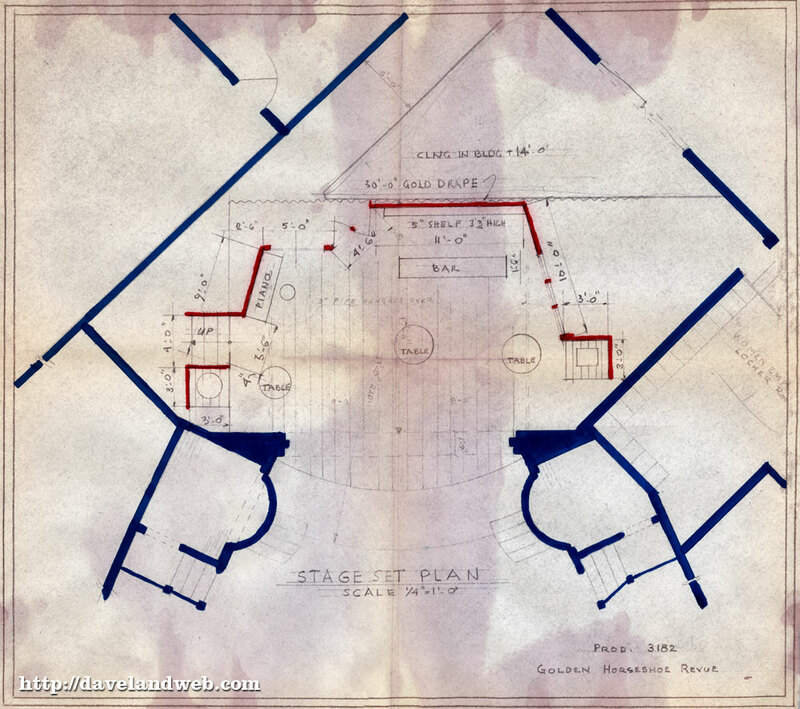 Here goes another series; this lot is undated, but most likely 1956. 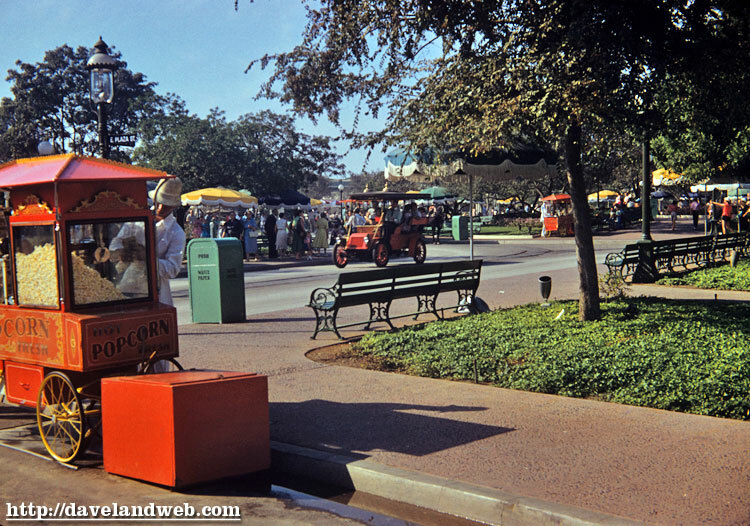 I’ll start off with, what else, Main Street (I hope those Legionnaires didn’t come from Philadelphia) and end with Central Plaza (that popcorn looks mighty tasty). 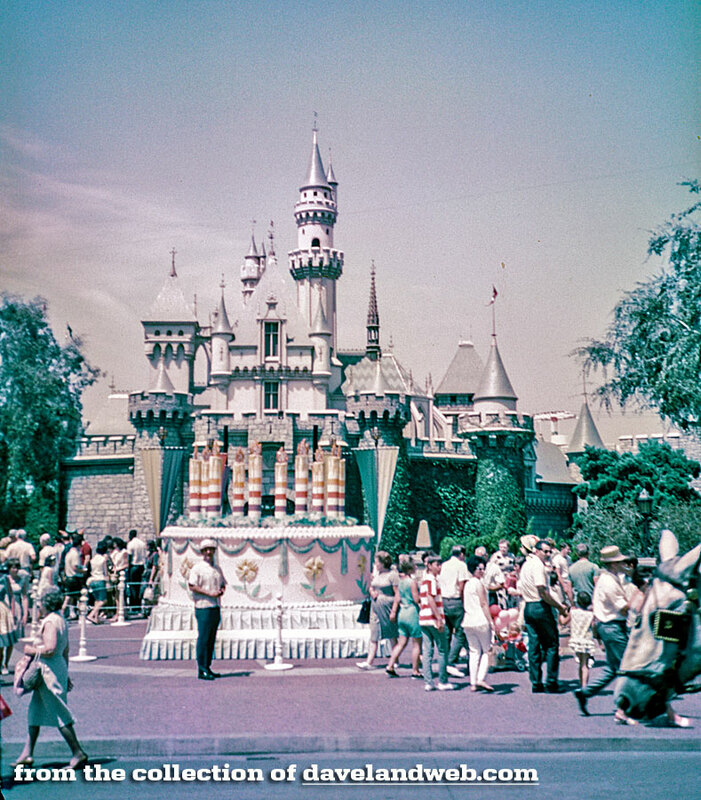 I sure love Technicolor/Kodachrome 50s slides; they rarely need color retouching. 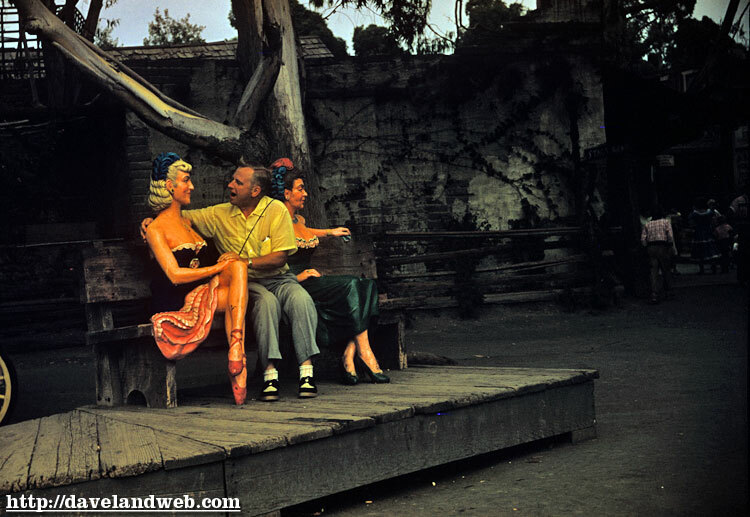 And for all you Knott-heads, I have added a Knotts Berry Farm page to my website. 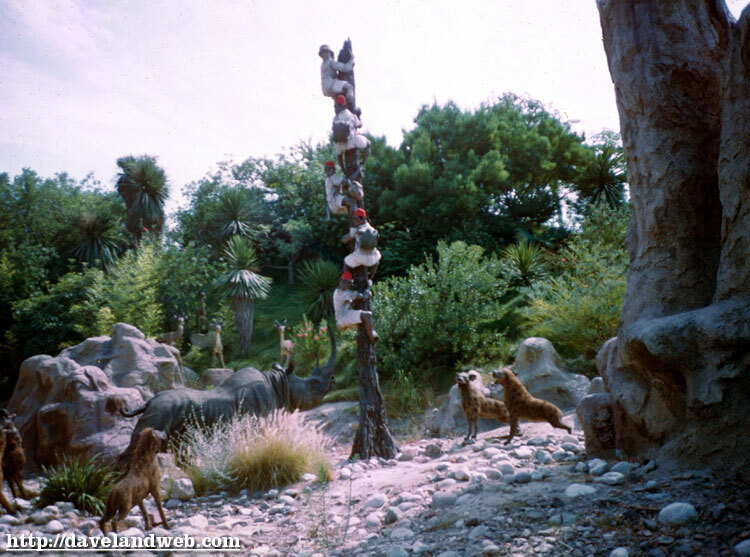 No, I am not collecting these, but often with the Disneyland slides come a few from Knotts. Enjoy. 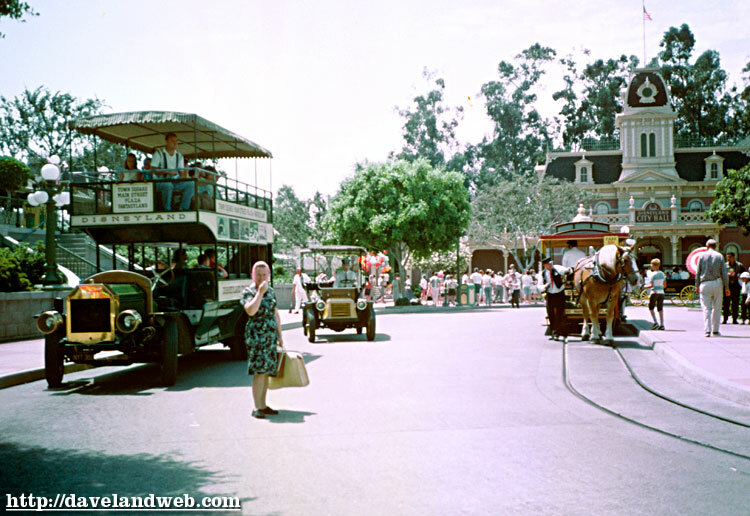 To see more Disneyland vintage photos, visit my regular Disneyland website, davelandweb.com/disneyland. 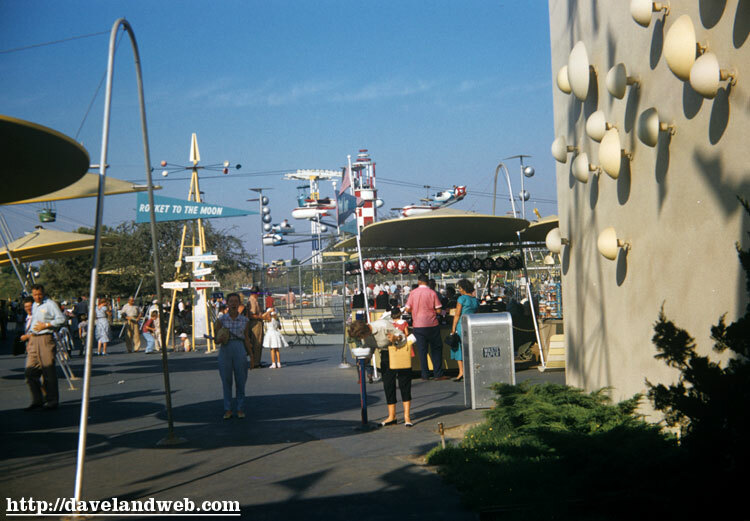 Labels: Central Plaza, Disneyland, Knott's Berry Farm, main street u.s.a.
Today is the last post of this series, and your last chance to see the gray tooth (even a white chiclet stuck in front would have helped). 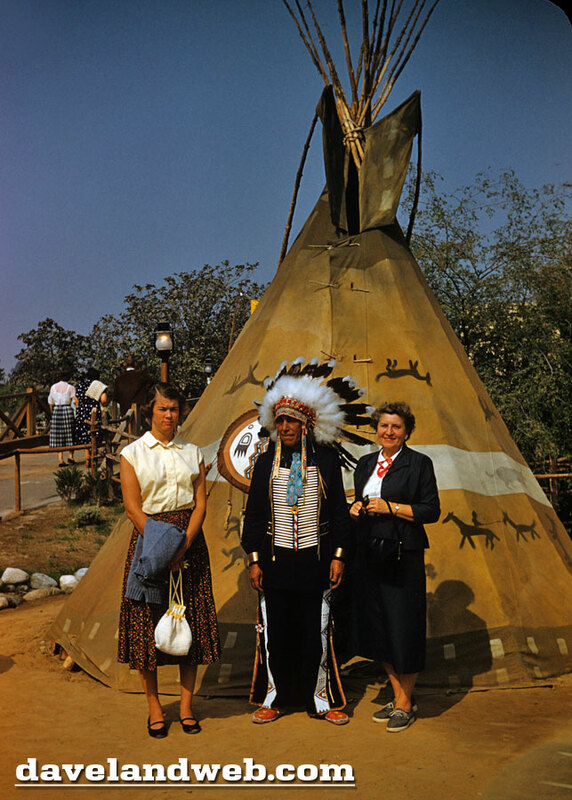 This duo really seemed to love the grittiness of the Rivers of America, including the Burning Cabin and the AA Indian Village. 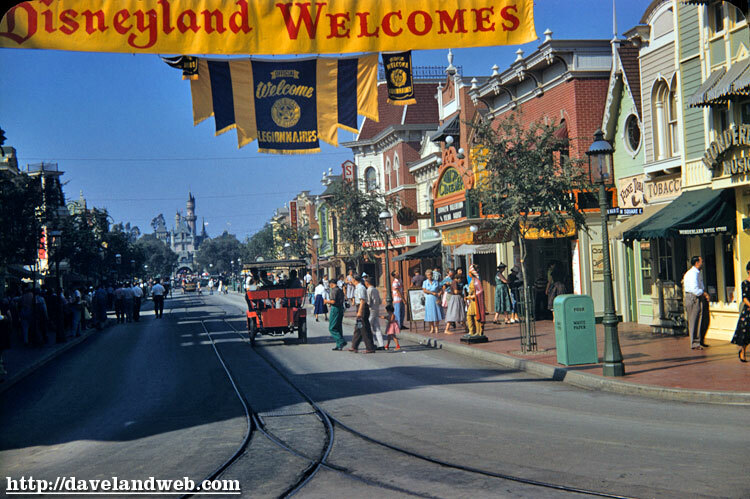 Obviously, Fantasyland was not there cup of tea (pun intended). 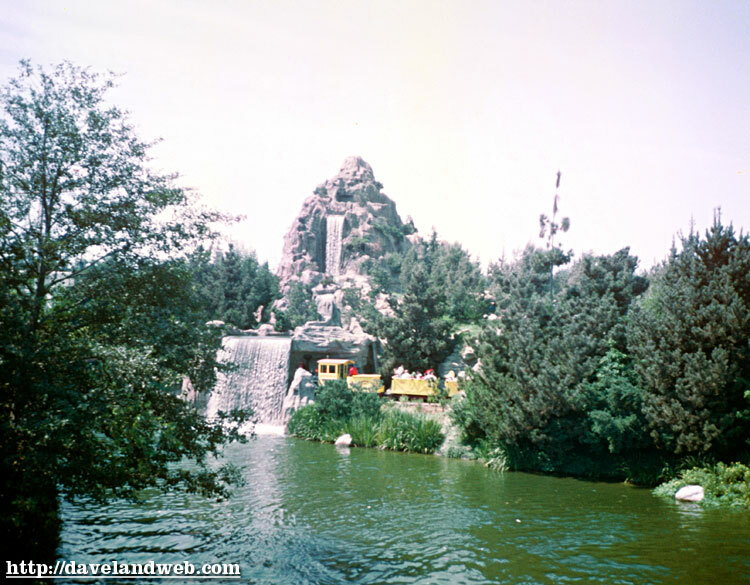 Of this whole faded bunch, the shot of Cascade Peak and NW Train are pretty much my fave. 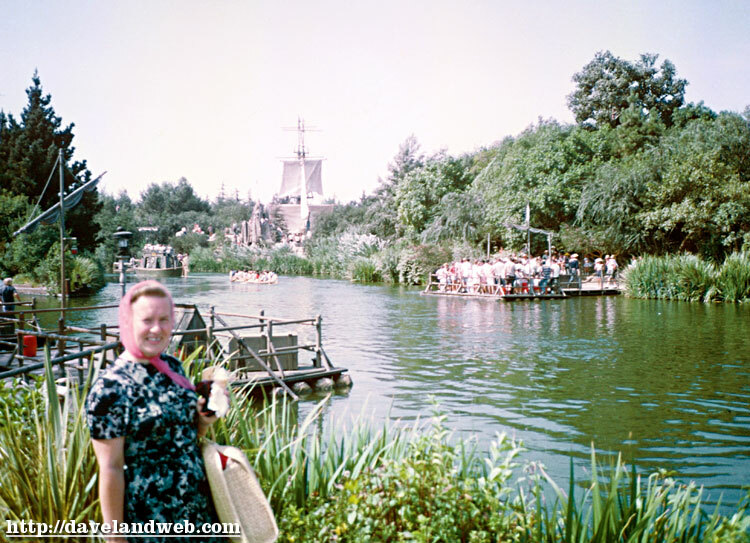 Today is the debut of “The Tooth.” First off, I will show a few pics from our Duo’s Jungle Cruise, and then finish up with our Red-Scarfed Heroine awaiting The Mark Twain for her first trip around the Rivers of America. 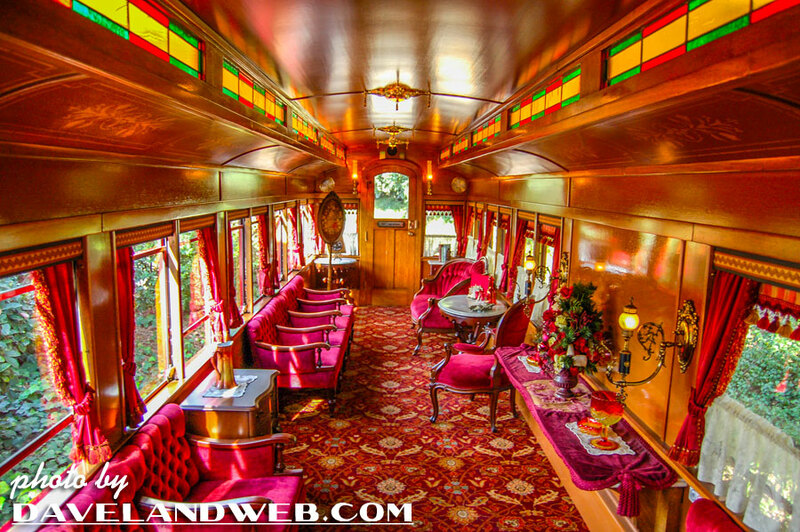 Tomorrow, I will post a plethora of pics from that trip, as it seemed to be the highlight of their day, judging by the number of shots taken from the Twain. 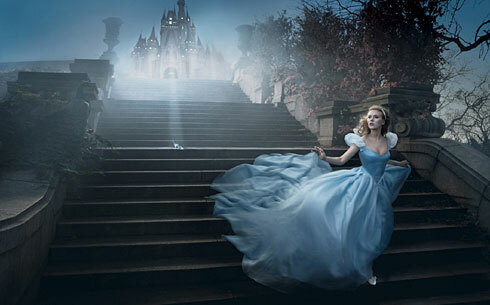 I am also going to include two pics I discovered via The Disney Blog this morning about a new photo series by Annie Leibovitz to go along with the Year of a Million Dreams Campaign. Here are two shots from that campaign. The first is Scarlett Johansson as Cinderella, and the 2nd is Soccer Star David Beckham as the handsome Prince from “Sleeping Beauty.” These shots are beautiful, and an excellent example of how modern day celebrity can be mixed with the classics of old to bring a new audience to Disney AND the park. So, yes, it looks like Disney will continue to keep packing 'em in for a long time! To read the USA Today article about this, click here. 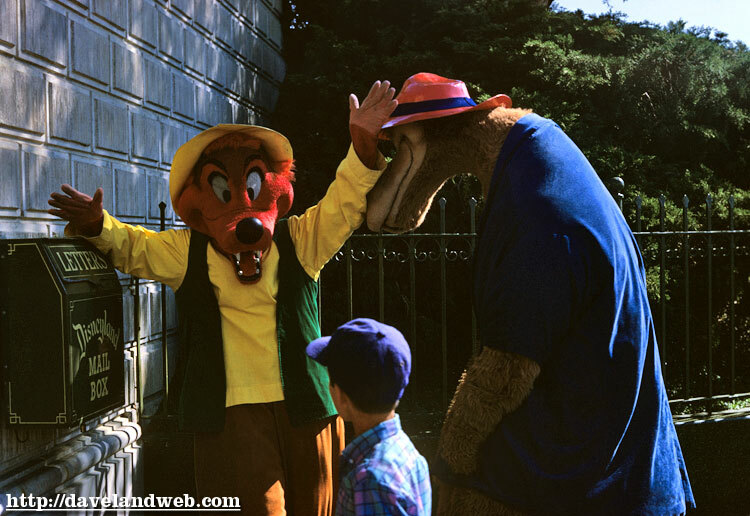 And one more before I close for today—yesterday, I stumbled upon a Disneyland Chat Forum that had linked to a number of my pics as well as Gorilla’s; one of the people on the forum commented about “all the free publicity” that I was receiving from their board. For anybody who thinks I am doing this for the money and that I am making a ton of dough from posting these pics, let me say it here: in the year I have been posting these pics, I have received a $20 donation from one kind gent, and that is it. This is definitely a labor of love and a desire to share these pics of yesterday with the many who enjoy them. 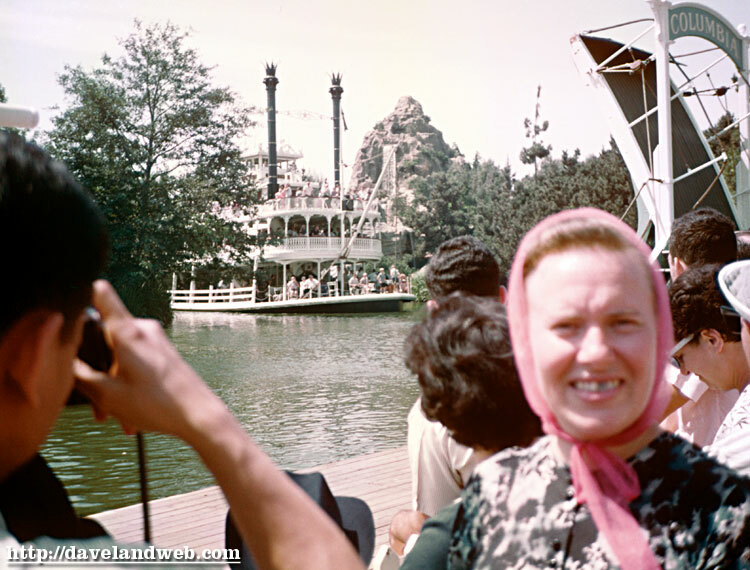 And as anyone knows who buys vintage photos/slides, they do not come cheap. End of rant. 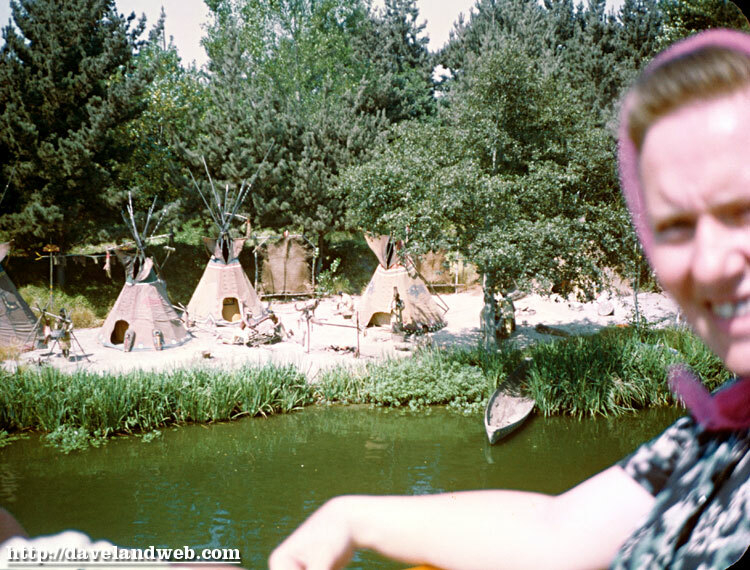 Here’s a series of photos from a couple’s trip back in 1965. The quality of the pics isn't the greatest, but this set does have a few cool view. You’ll see a lot of this lady’s red scarf, as well as her gray front tooth (something to look forward to in future posts). 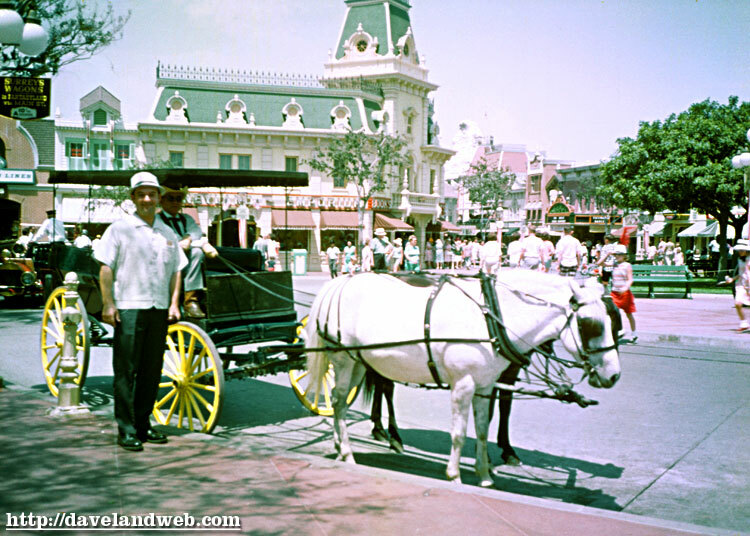 Here she is in Town Square, trying to figure out which vehicle to ride down to the castle. Better figure it out quickly, Lady, or you're going to get run over! Once at the castle, they were able to celebrate with a piece of the 10th Anniversary Cake. 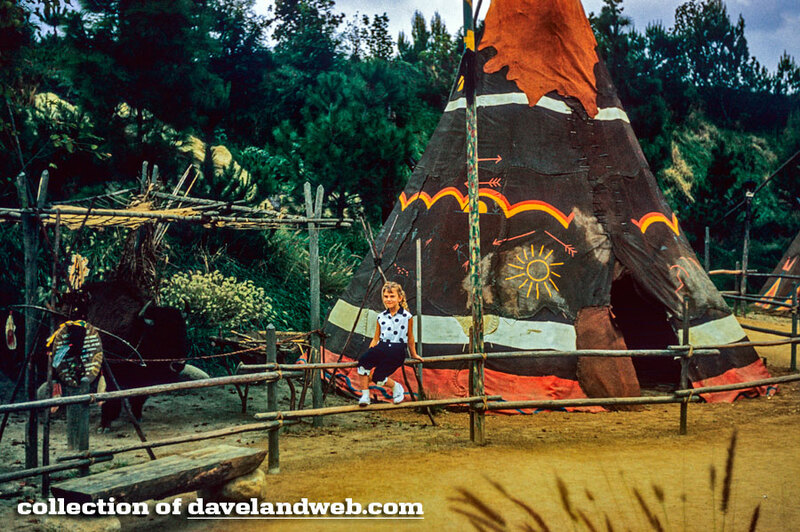 For more vintage & current Disneyland photos, visit my main website, davelandweb.com/disneyland. 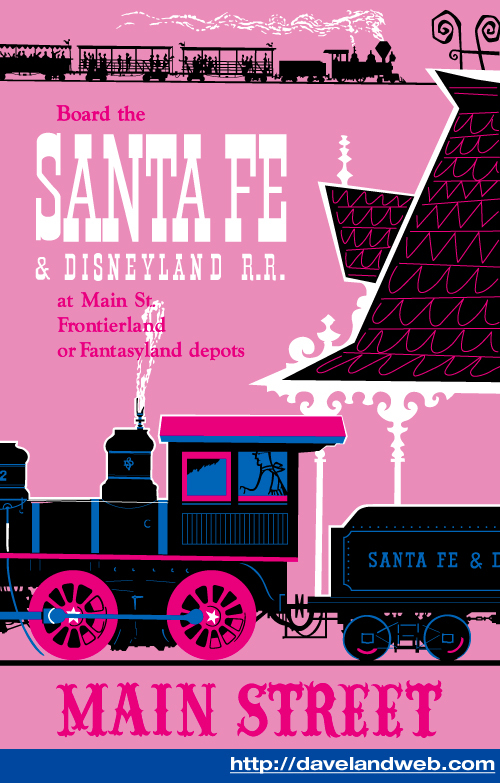 Originally, the Disneyland Railroad was sponsored by the Santa Fe Railroad, as you can see from this original poster art and the signage on the Main Street Station (circa 1959). 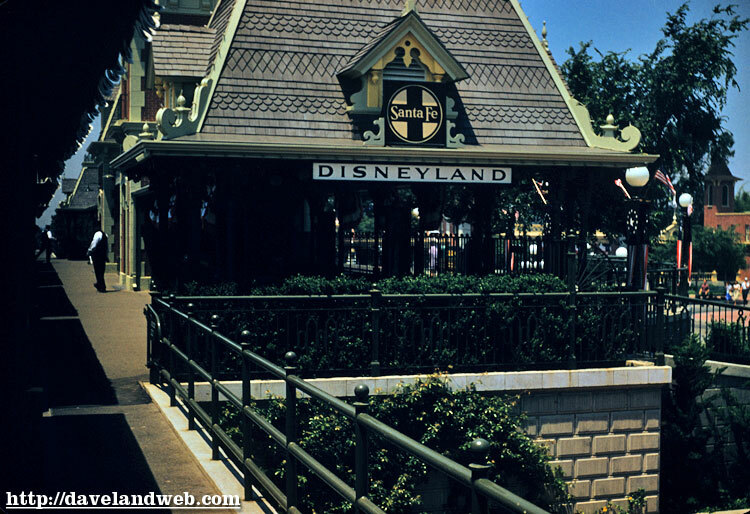 Due to a contractual dispute with Alweg & The Monorail (Santa Fe was to have exclusive Railroad transportation sponsorship in the park), the relationship dissolved and eventually ended in 1974. 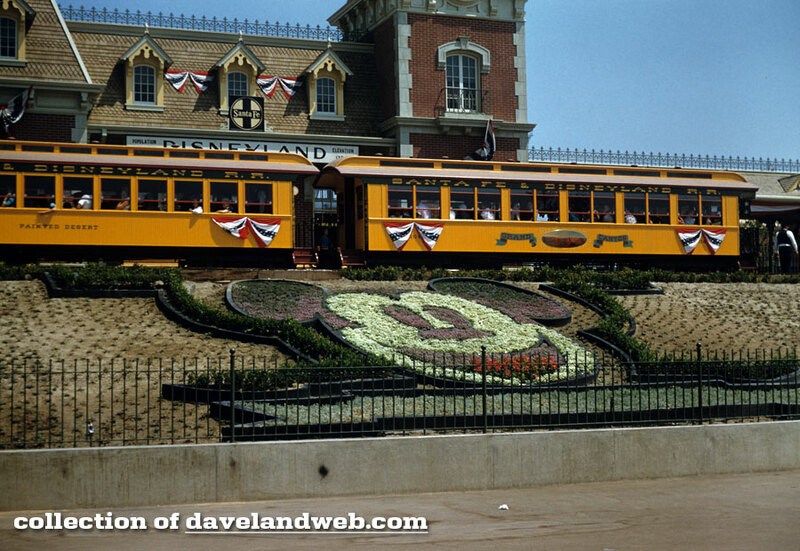 Also in 1974, the Grand Canyon Observation Car, picture in this 1955 slide, was transformed into the ornately Victorian Lilly Belle. 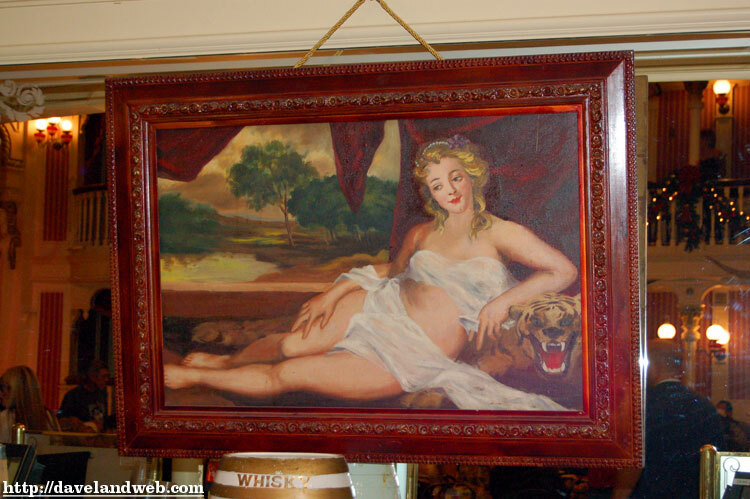 I have included a closeup of the hard to find Grand Canyon art, as well as some recent interior shots of the Lilly Belle. Follow my Daveland updates on Twitter. 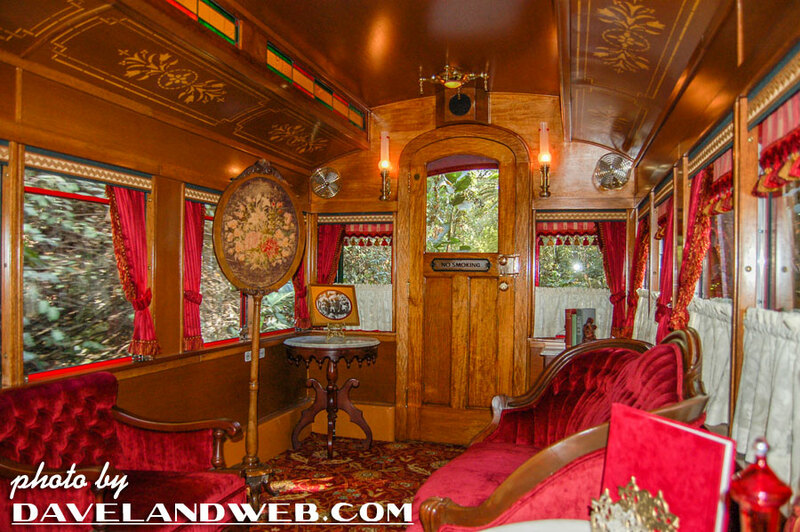 See more vintage & current Disneyland Railroad photos at my regular website. 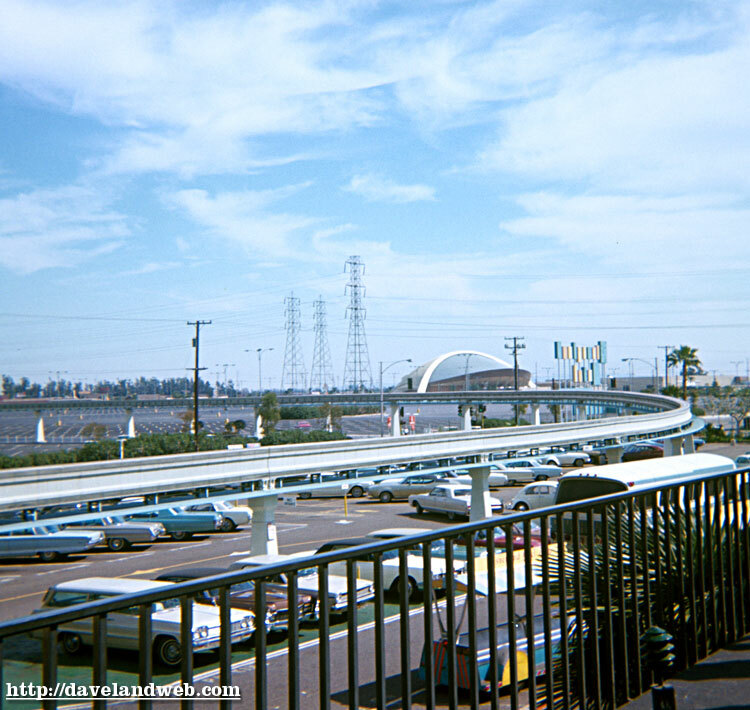 Here’s a parking lot shot from April, 1966. And to add a little controversy, I am throwing in some March 1968 shots of characters from that NASTY NASTY movie “Song of the South” (anyone who thinks I'm being serious about it being nasty, please have a cocktail). 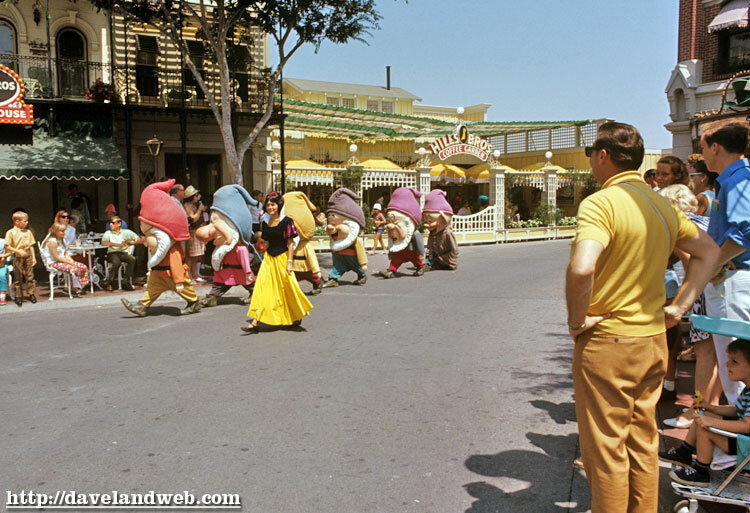 It always cracks me up that the movie can’t be released because it’s so racist, but the characters can be featured in one of Disneyland’s most popular attraction. Huh? 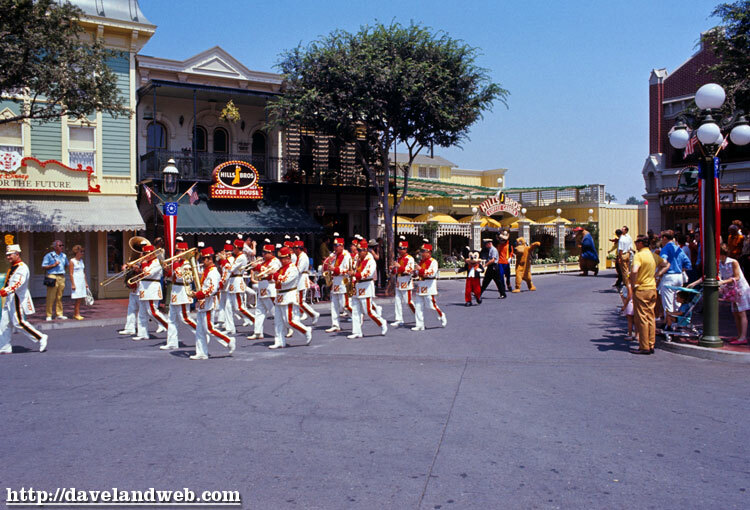 This last one is from September 1969. HAPPY 200TH POST TO ME. 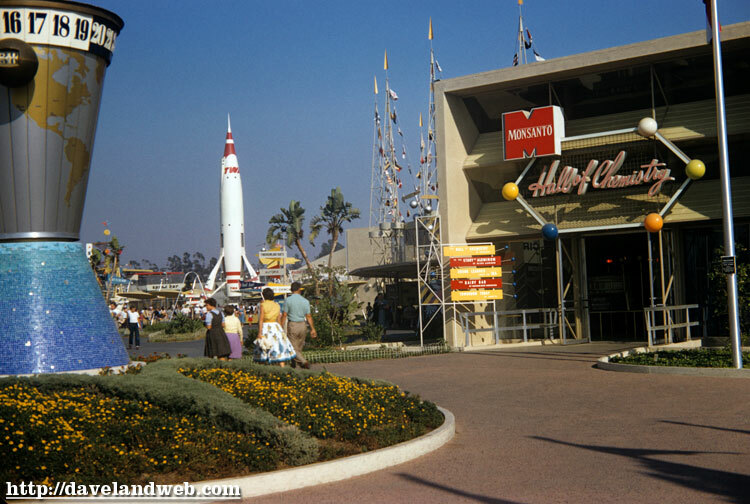 In 1962, Walt “packed up” Disneyland and took it to the East Coast for a show at Radio City Music Hall. According to this press photo and description, it must have been some show. The recently released Disney Treasures/Vault Series has a clip from the show if you are interested in viewing it. 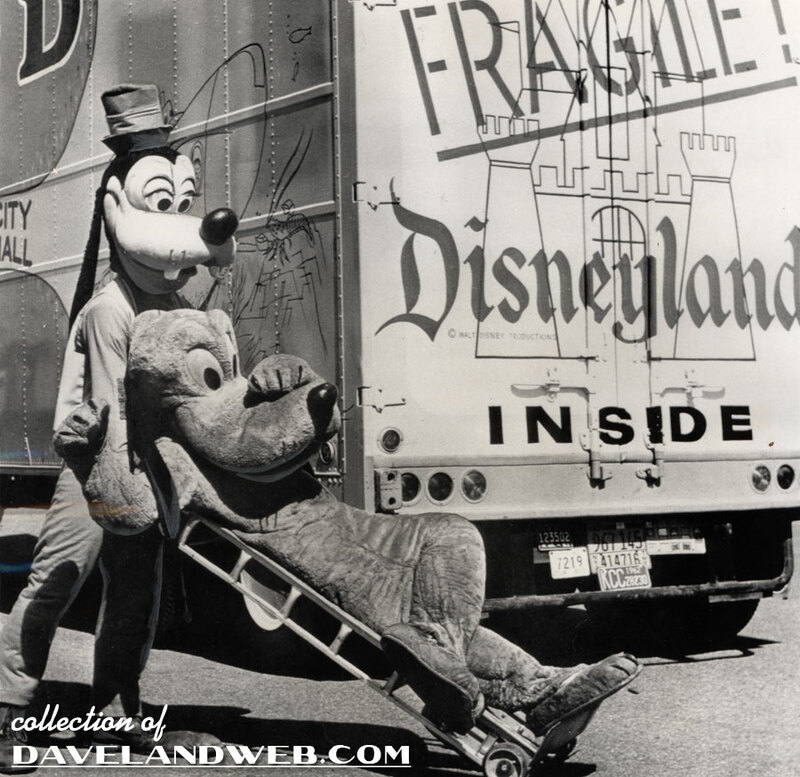 The caption for this photo says: “Walt Disney characters Goofy and Pluto make like movers shortly before the departure 3/6 of four large moving vans for New York’s Radio City Music Hall where Disney will present his first stage production “Disneyland, U.S.A.” which will open April 5. 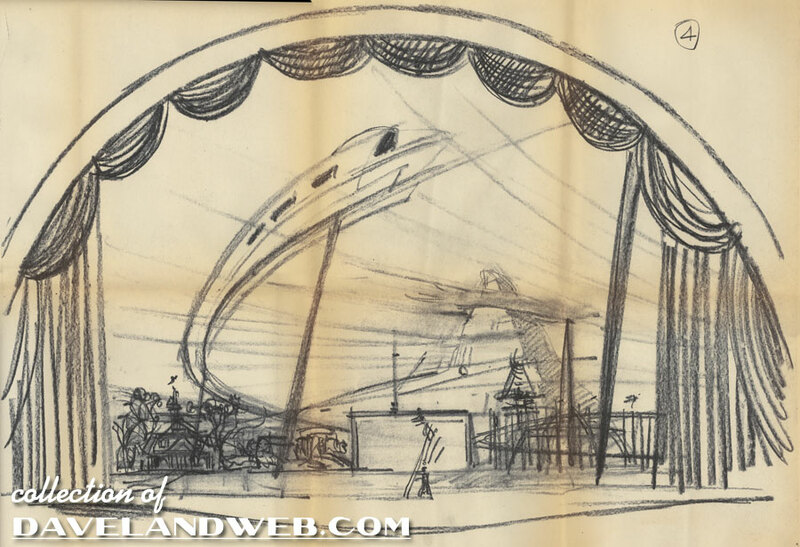 Included in the cargo caravan now enroute are many well known Disneyland attractions, including the fire engine, horse-dran streetcard, costumes and properties for the New York production.” I have also included a sketch of the layout of the stage; I have no idea as to the creator or origin of this sketch. It came with a batch of Golden Horseshoe press photos. If anyone has any info, that would be great. 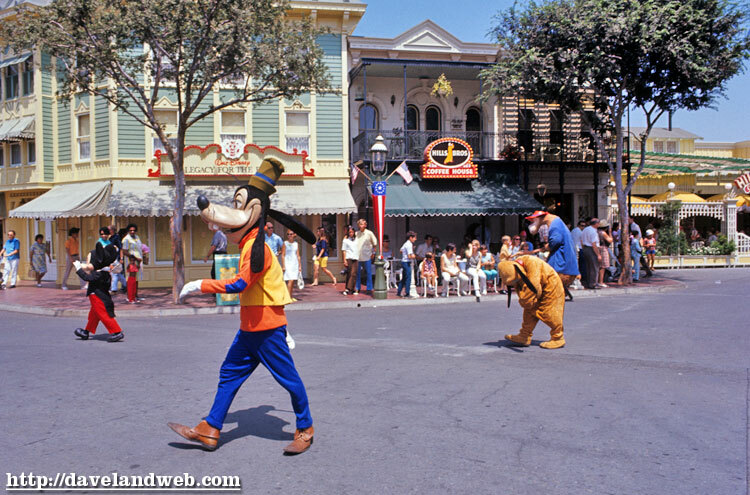 I know - this batch is just on the verge of the 70’s, but it’s still an awesome look at this corner of Town Square, including the Hills Brothers Coffee House Restaurant (which closed in 1976). 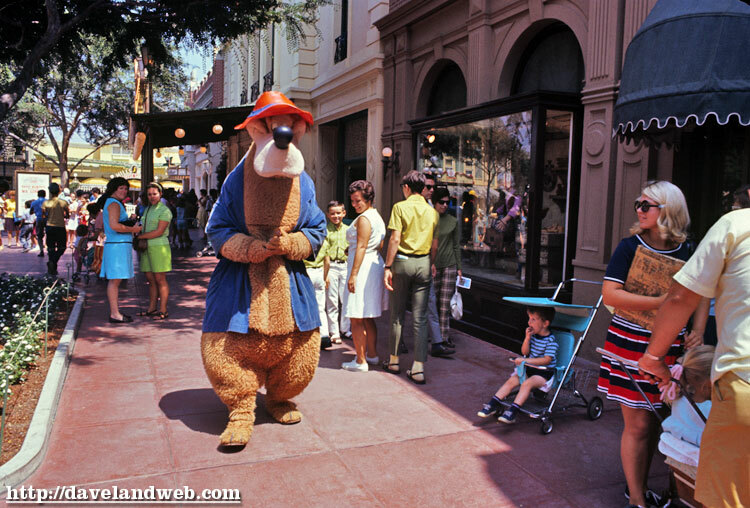 On the corner is “Walt Disney: Legacy for the Future”; this is a shop I am not familiar with. Anybody have any details on it? 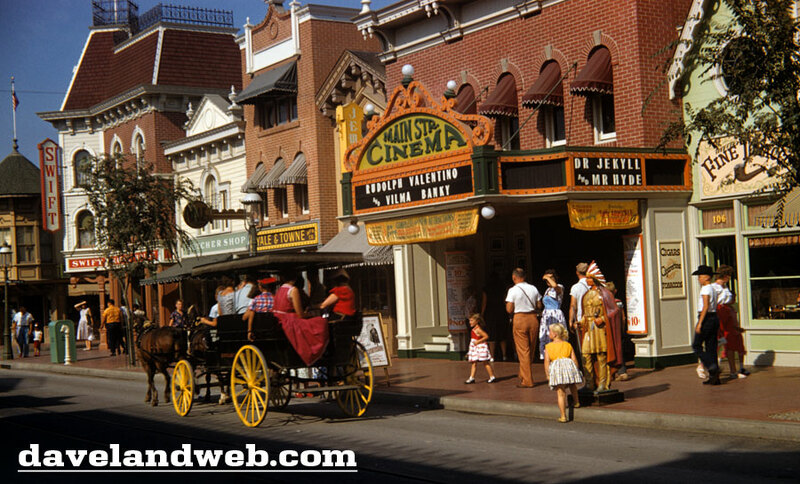 Currently it is the Disney Showcase and formerly the Wurlitzer Music Hall (1955–1968). And here’s the Pearly Band; I wonder if Mary is somewhere around? 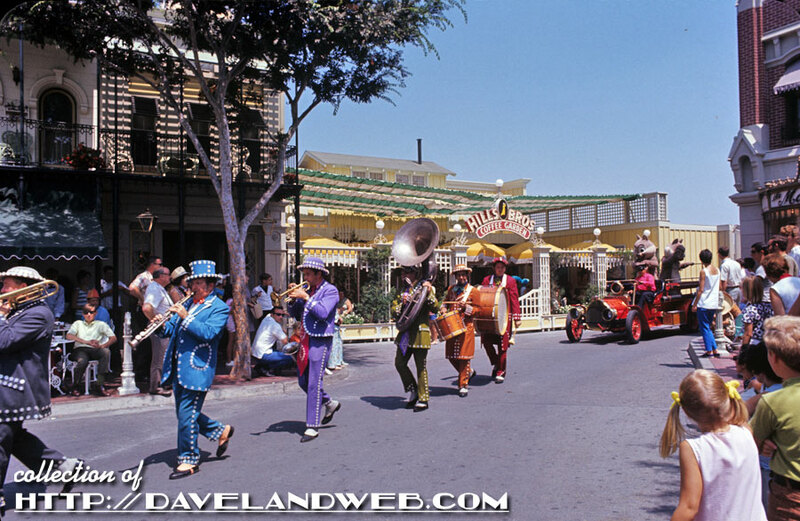 See more vintage & current Daveland Disneyland Parade photos on my main website. Wow - didn’t know the Flight Circle and Art Corner would get the comments going again. Who knew?!? 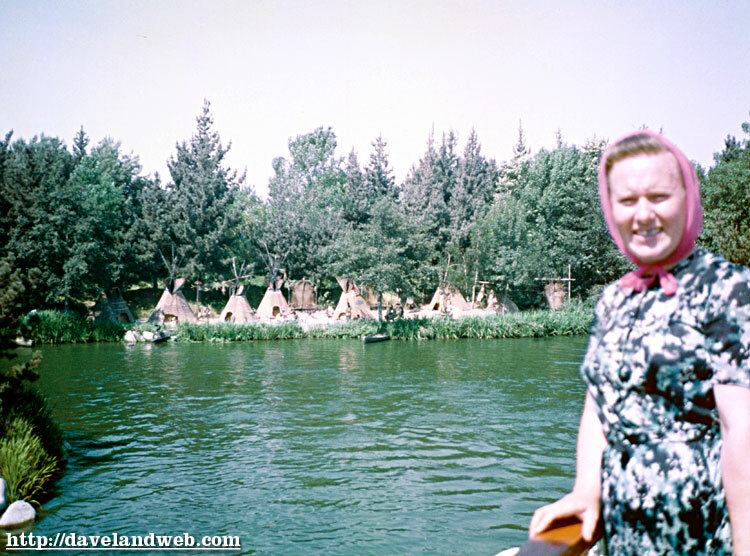 So for today, I’ll make things a little calmer in the comment department by posting some Indian Village slides. The headliner is from 1955; They all look so happy to be together. 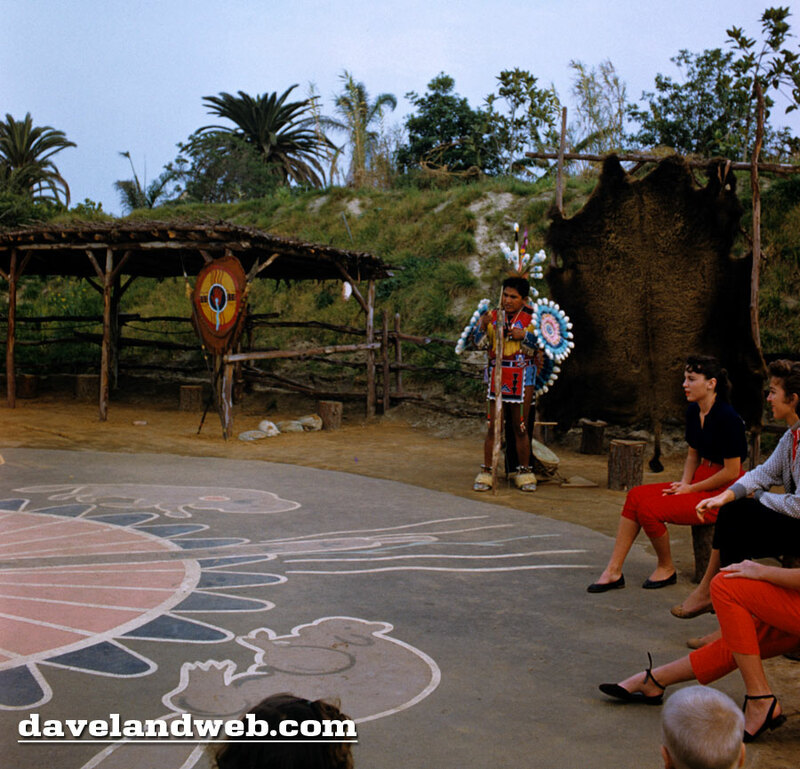 Shot two is taken at the Ceremonial Dance circle, December 26, 1955 (looks like it was warmer back then). 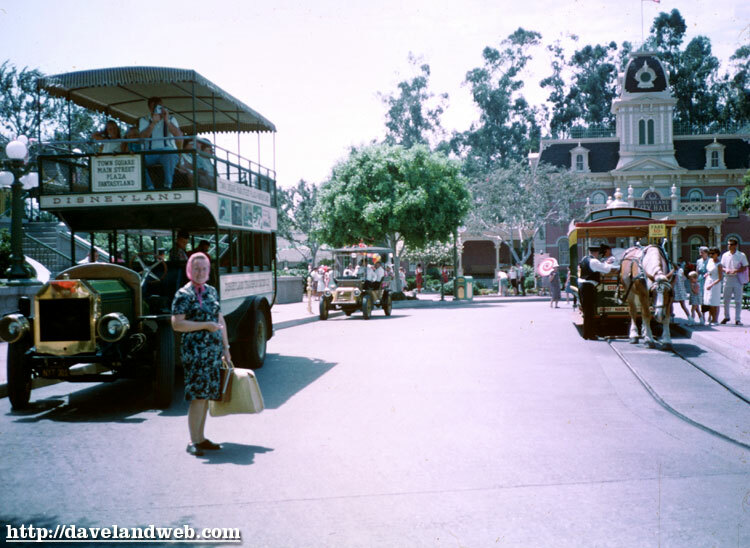 Coming in for a rip-roaring finish are these other 1950’s slides. 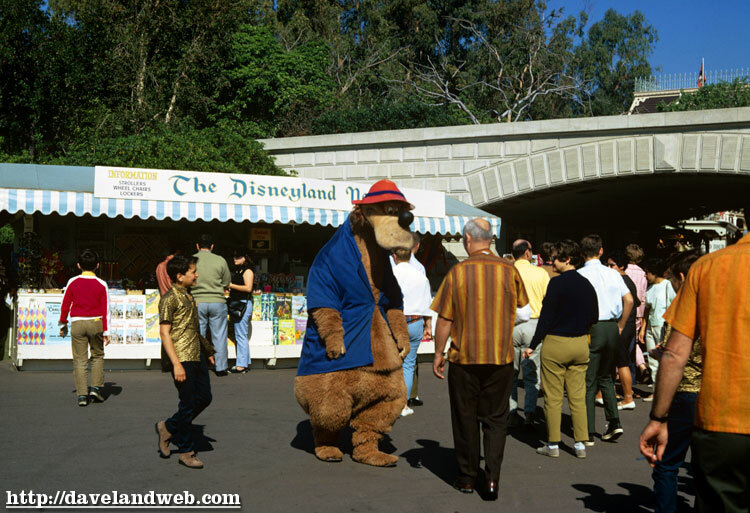 In all honesty, this would be cool to have at DLand; much better than Winnie the Pooh. These guys look like they have more attitude than the Supremes. Be sure to catch the Buffalo/Bison on the left side of this shot. 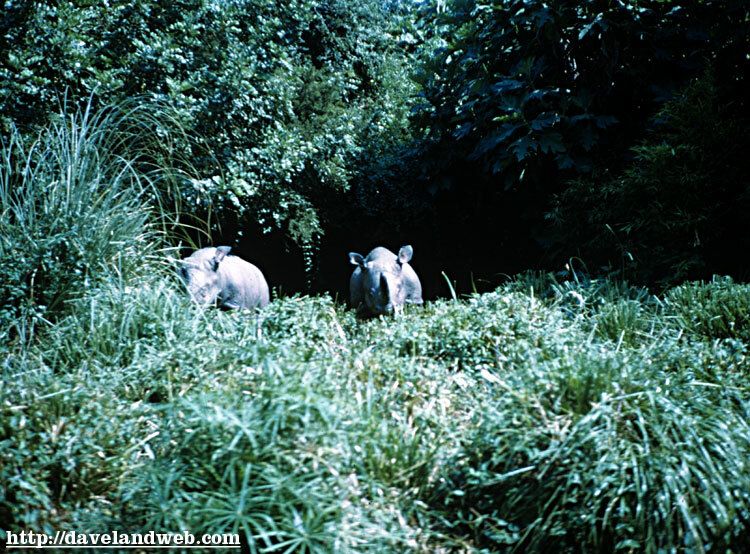 For more Indian Village photos, visit my regular website.